A proverb advises against putting all of our eggs in one basket. Andrew Carnegie advises us to put all of our eggs in one basket and then watch it. Both of these can be considered good advice. The proponents of diversification advocate the more diverse a portfolio, the less risk from each of its components. This argument makes logical sense on the surface but really needs to be explored in the context of our individual plan. There are countless ways to achieve Financial Independence. You will choose one way – your way. You will strive to be the expert of your strategy. Many people choose to focus on stocks or real estate. Some start their own business. Some combine any or all of these to reach FI. Even within each of these categories there are varying levels of diversification. For example, the portfolio of a real estate investor may include only single-family properties in their hometown and another might include single-family, multi-unit, and commercial properties in multiple states. In the realm of stocks, the portfolio containing a single tech company stock isn’t diversified compared to one with the majority of holdings in a broad stock market index fund such as Vanguard’s VTSAX or Fidelity’s FSTVX. One would be even more diversified if they added international stocks or bonds to their portfolio. Practically, our level of diversification becomes a result of our basing investment decisions on our unique circumstances including our understanding of and appetite for risk. As people assertively pursuing Financial Independence, we are likely to be less concerned with the term diversification than we are with the general term risk. With a little research, we can determine for ourselves if a specific investment fits our personal risk profile. Mitigating the downside risk of any decision should always be considered. The Financial Independence of a person investing in single-family rental properties in one location may or may not be at any more risk than the Financial Independence of someone who focuses on investing only in a single broad market index fund. Various techniques used under each strategy can lead to success. A question to focus on is, “Based on everything I understand at this point in time, does my chosen strategy have a high probability of being successful?” If the answer is yes, you are in good shape. If the answer is no or you are unsure, then spend some time learning and speaking with others along their FI journey who have successfully incorporated similar strategies. This will develop competence and confidence. Then, modify your plan as appropriate to increase the likelihood of success. An increase in understanding of successful strategies will lead to selecting a strategy, simple or intricate, for reaching Financial Independence. When ready, take action, monitor progress, and make adjustments when necessary. This journey is dynamic and things will absolutely change over time. You will build relationships with other smart people who “get it” and they will add value to whatever strategy you’ve chosen. Other factors will increase or lessen the risk of you reaching your FI goals as planned. You may change jobs that increase or decrease the amount of money you are able to invest. If you own a home, it may appreciate or depreciate significantly, introducing opportunities or challenges to consider. You are the ultimate authority of your money decisions and executing your strategy to reach Financial Independence. An optimistic questioning attitude will lead to increased knowledge about various asset classes such as real estate, stocks, bonds, and business which can cultivate a willingness to consider integrating new approaches into your plan. During this process, risk will become a constant consideration and your portfolio will reflect that. 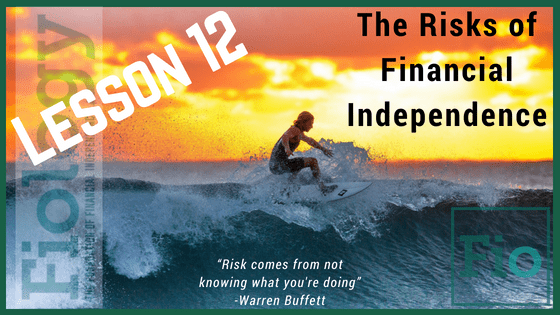 The links below will touch on the topic of risk in general and will provide you plenty to think about in the context of your own FI Journey. Take Action: List 3 potential risks in your current FI plan – share below in the comment section if you’d like. Think of ways you can eliminate or mitigate these risks. If you are not sure on how to eliminate or mitigate the identified risks, conduct the necessary research to build your competence and confidence. Implement the changes and continuously monitor to identify potential risks in your strategy and techniques. I was talking about FI with a friend of mine the other day (he has not yet drank the Kool-aid), and his biggest trepidation was risk. He is a highly risk-averse person, and his wife is too, and therefore he feels they could not pursue FI. He seemed to have a very hard time separating the idea of FI from the Early Retirement aspect. I am not the best at explaining things in the details that I see in my mind, so I probably didn’t help too much, but my basic explanation of the whole concept was simply to get to the point where work was an option, not a necessity. I feel like being in that position is the least risky of all. Risk, like many aspects of our FI Journey, is defined a little differently for each of us due to our experience, knowledge, and unique circumstances. Maybe this lesson will give your friend a little bit more of a solid framework from which to assess his own situation. Thanks for the comment and for your contributions to Fiology!